Sub-Zero and Wolf's typical 90-day field trials were not providing timely information that could be acted upon in parallel to the trial, and the results were difficult to quantify and prioritize. They needed a way to move quickly to improve product under development. 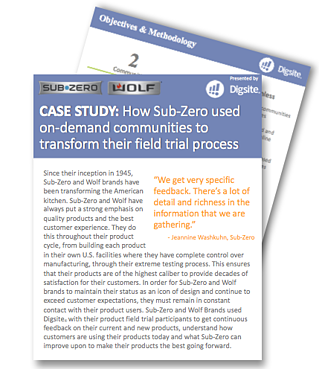 Sub-Zero and Wolf needed an on-demand, effective solution that would provide the opportunity for in-depth conversation around individual product feedback. So, they turned to Digsite.